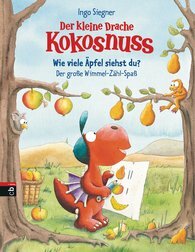 The Little Dragon Coconut – How Many Apples Can You Find? Hardcover, 16 pages, 21.0 x 27.0 cm, 8.3 x 10.6 in. Counting isn't all that easy, the little dragon Coconut and his friends porcupine Matilda and guzzly dragon Oskar discover. How many apples would they need to make a cake? And how many nails to build a treehouse? With this book of fun focussing on counting and look-and-find you have to pay a lot of attention if Coconut, Matilda and Oskar are to eat their cake in their treehouse.